Everything you need, from finding us at the airport to travelling around Banff. The first thing to remember when flying into Calgary Intl. Airport is that it’s one of the nicest and most easily navigated airports in the world. Luggage carts are free and help is just around the corner thanks to countless White Hat Volunteers. Plan on 45 minutes to one hour to collect your bags and make it to our desk. For example if I were to arrive at Calgary Airport between 12:15 and 12:30 I would book the 13:30 scheduled service from Calgary Airport. If it’s tighter than this; for example a 12:50 arrival I would suggest that you book the 14:30 and then move to the 13:30 if you arrive on time/early. This is to avoid booking the 13:30, missing it and then finding the 14:30 is sold out, leaving you to wait until 15:30. You’ll notice when you make your reservation that we ask for your flight information. We use this to track your flight throughout your travel day. If you’re unable to make your flight due to delays, we’ll know about it and will book you on the next available shuttle, meaning you have no need to worry while in the air! This service is offered free of charge. Upon your arrival at Calgary Intl. 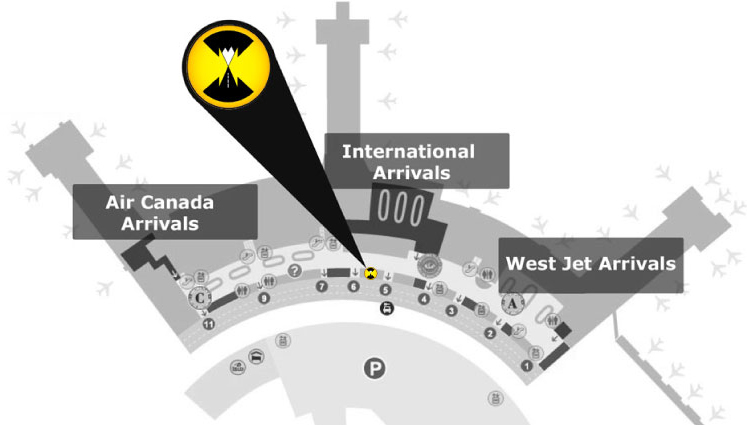 Airport you’ll find us located between exit doors 5 and 6 at area “B” of the main arrivals level (see map below). We’re conveniently located between Tim Horton’s and Starbucks! Pick your poison. Checking in is super simple. Just pull up to the desk and have your last name handy. Checking in with Banff Airporter® is easy. When you arrive at our desk you’ll find a smiling agent ready to check you in. Your bags are preloaded by your driver. The entire process is a smooth 20 seconds and all you need to know is your last name…no paperwork required. Once in Banff or Canmore your bags are delivered right to your front door. Banff is a pedestrian town. Taking advantage of our wide sidewalks and short walking distances makes for the best way to experience the Town of Banff. You may enjoy a trip down the 1A or the Icefield Parkway. It’s a great way to spend a day. We suggest taking a tour or renting a car from one of our many Banff based rental car companies instead of renting from Calgary only to worry about parking, fuel, insurance and the other hidden costs of a weekly rental. If you’d like to visit Canmore use ROAM, a community run transit system. 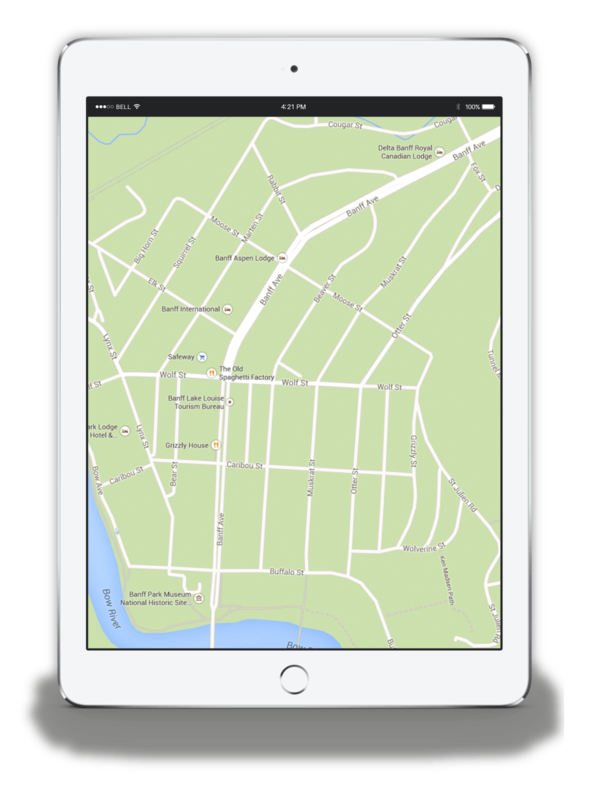 ROAM also services the Town of Banff. You can’t miss their buses as they all sport a different animal “wrap” that covers the entire bus. Using Banff Airporter® is about as simple as it gets. Upon your arrival at Calgary Airport you check in at our desk. At that point we’ll take your luggage for you and you’ll be escorted out to the bus. 2 hours later you’ll be dropped right to your front door. No need to worry about directions, traffic, the rental car company not having the SUV you wanted and all of the other worries and liabilities that come with a vehicle rental. Banff Airporter® is the best way to get between Calgary Airport and Banff. We make it easy to book online with daily departures and comfortable transfers. Have a question? Find the answer. Help is just around the corner. Feel free to contact us if you don’t feel like reading or if you’re question(s) are not answered in this section. Need to know legal info? Maybe you need to know what types of payment we accept or re-scheduling information, or perhaps our policies on “no show” or other relevant information, it’s all in legal.